This Groundhog Day, why not relive the making of Groundhog Day? In early 1992, a Hollywood film crew led by director Harold Ramis descended upon the quiet community of Woodstock, Illinois to film Groundhog Day, a quirky comedy in which Bill Murray plays a vain, selfish weatherman who ultimately becomes a better, more thoughtful human being after being trapped in a strange time loop, reliving February 2 over and over again for years before being allowed to rejoin the normal flow of time. Though the plot revolves around Pennsylvania’s famous Groundhog Day ceremony, Woodstock stands in for Punxsutawney, Pennsylvania in the completed film, since the quaint, old-fashioned location better resembles the charming small town described in Danny Rubin’s original script. Its connection to Groundhog Day remains a point of pride for Woodstock, especially as the film has garnered a reputation as a classic through television airings and home video, even being added to the United States National Film Registry in 2006. As some extant home movies show, the filming of Groundhog Day was a big deal in Woodstock even before the film became a perennial. Thanks to YouTube, fans can now see behind-the-scenes footage of several of the movie’s key scenes. Probably the movie’s most famous running gag is the antagonistic relationship between Bill Murray’s character, Phil Connors, and Ned Ryerson, a garrulous, tacky insurance salesman played by the ubiquitous Stephen Tobolowsky. Because of the movie’s repeating structure, Murray encounters Tobolowsky again and again, frequently putting his foot in a water-filled pothole in the process. For the curious, here is what the filming of that scene looked like from an onlooker’s point of view. The cameraman for this particular clip is a man named James Carvis, who served as an extra and stand-in during the film. Carvis died on February 1, 2015, the day before the famous holiday, but his behind-the-scenes footage lives on. At one particularly manic point in the movie, Bill Murray’s character decides that perhaps he can interrupt or end the time loop by kidnapping Punxsutawney Phil, the rodent at the heart of the Groundhog Day ceremony. The ensuing car chase was also captured on tape by onlookers, one of whom refers to Harold Ramis as “Bill Ramis,” confusing the director with the star. This is another moment captured by the late James Carvis, so perhaps it is Carvis’ voice on the tape. A third James Carvis clip, similar to the other two, centers around a sequence in which Bill Murray uses his split-second knowledge of life in Punxsutawney to swipe some money from an armored truck. From a bystander’s perspective, all it really looks like is Bill Murray crossing the street a few times. Co-star Robin Duke, currently a cast member of Man Seeking Woman, is also visible here. Only the connection to a beloved film endows this VHS footage with any real significance. 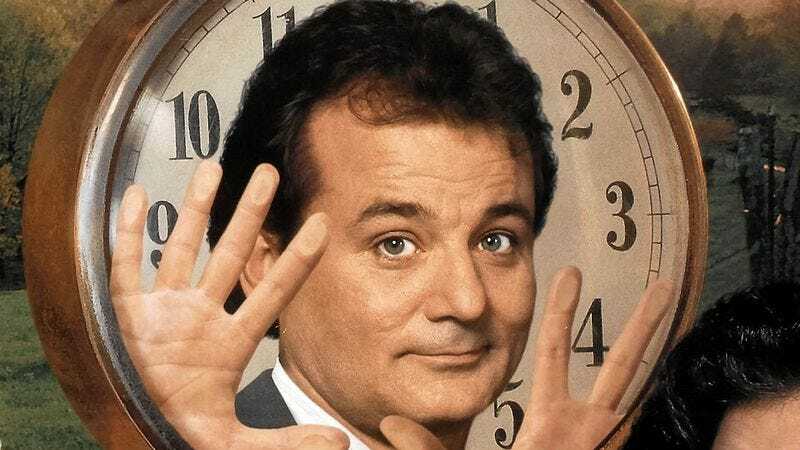 Those who are familiar with Groundhog Day, however, will see that the film’s plot is a lot like the making of a Hollywood motion picture: Both involve doing the same exact thing, again and again and again. Bill Murray wasn’t just starring in Groundhog Day. He was living it.